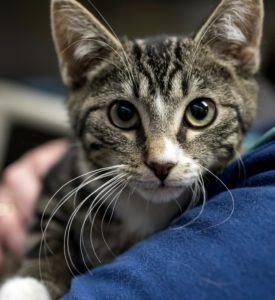 My name is Phineas and I am a handsome little guy with my tabby coloring and white paws. Something really scary happened to me, but I was rescued and am on my way to a happy ending! Even though I am still a kitten, born in September 2016, I was abandoned by my previous owner and left outside when they moved. Thank goodness for a kind neighbor who helped me! I have been vetted and home fostered and Love Love Love being safe and warm and held and cuddled! Please come by to meet me and be ready to fall in love! This entry was posted in Adopted, Adopted Cats, Cats, News, Under 6 Months, Wantagh Adoption Center. Bookmark the permalink.